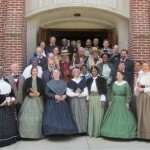 Enjoy the sights, sounds and music of the 19th Century—including concerts and family activities by Washington Revels vocal ensembles, musicians and actors—as “The Civil War Comes To Rockville” on June 29, 10:00am-8:30pm. This free event (the centerpiece of Heritage Montgomery’s 16th annual Heritage Days Weekend) is part of the sesquicentennial commemoration of the Civil War, marking the day Confederate General James Ewell Brown (“Jeb”) Stuart raided Rockville, delaying his arrival at the Battle of Gettysburg—a delay that, some historians argue, may have affected the outcome of the battle and changed the course of the Civil War. Washington Revels is co-sponsoring this event along with the City of Rockville, Heritage Montgomery, the Montgomery County Historical Society, the Arts & Humanities Council of Montgomery County, the Convention & Visitors Bureau of Montgomery County, and Peerless Rockville. Come and enjoy a day filled with concerts, crafts and demonstrations, and appearances by historical figures (including President Abraham Lincoln!). 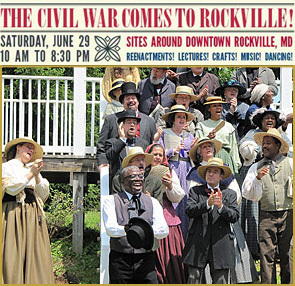 Have fun learning about life in Rockville during the war; take a walking tour of Civil War-related sites; delight in children’s activities and a family sing; and kick up your heels at a community country dance featuring the Roustabout String Band at evening’s end! Featuring the Washington Revels’ Heritage Voices, Jubilee Voices and Roustabout String Band. President Abraham Lincoln makes a special appearance and speech during the second concert. Authentically costumed and featuring instruments dating from the Civil War era. Historic portrayals of Abraham Lincoln, his secretary John Nicolay, and Ann Maria Weems, a former slave on a Rockville farm who, as a young girl, escaped to freedom on the Underground Railroad disguised as a coachboy. Portrayed by MCHS interpretive docent Clarence Hickey. A reenactment of Stuart’s historic ride, on June 28, 1863, into Rockville and capture of local citizens. An old-time country dance for kids and adults alike, with Roustabout String Band and dance caller Janine Smith.